Pegasus Coin aims to become one of the most utilized digital currencies in the world through massive global adoption. To have a better understanding of how the firm behind the Pegasus Coin, Kazakhstan Horseracing Association intends to achieve this, it is important to comprehend the fundamental economics of Pegasus Coins such as the token flow, demand, supply and its potential underlying value. In 2019, the construction of a 113-hectare Kazakhstan Horseracing Park, or KHP, will present the world’s largest cryptocurrency-based integrated facility development that will consist of an amusement park, hotel development, horse racing and training facilities among a host of other properties. The KHP will cost an estimated USD 200 million to build, which is expected to experience 30% annual growth over the first decade, on an estimated USD 2.3 billion in turnover from their first year of operations. The KHP is part of the Pegasus Internal Ecosystem or internal applications, that also includes OTBs, equine blockchain registry and equine trading. The internal ecosystem can be perceived as the nerve center of the Pegasus ecosystem. It serves as a means of control that symbolizes the preservation of the value of Pegasus Coins. The enforced utility of Pegasus Coins within the internal ecosystem assures stakeholders of its long-term stability and security. With many people expected to hold Pegasus Coins for use in the internal ecosystem, its utility will surely gradually extend to the rest of the world. This will be the basis for the second main component of the Pegasus Ecosystem; the external ecosystem. External applications are ways that Pegasus Coins are used in various physical and web-based companies around the world, essentially an alternative global payment platform. These external applications involve gaming, online shopping, leisure, lifestyle and various other activities that are used outside the Kazakhstan Horseracing Park. Products and services within the external and internal applications of Pegasus Coins will be purchased from international cryptocurrency exchanges through the Pegasus Pay wallet. A significant impact of the ecosystem is that it aims to create a world that transacts in digital currency and not physical cash. The Burnback Scheme is KHA’s way of rewarding its community and shareholders; by decreasing coin supply, preserving coin value, increasing demand and ultimately promoting exclusivity for it. KHA will use earnings from the park to buy back Pegasus Coins from the exchange and burn them. Coins that are burned are sent to a verifiably unspendable address of which they are taken out of circulation and lost forever in cyberspace. This address can never be accessed or used. The Proof of burn method provides anyone interested with empirical and untampered evidence that Pegasus coins have been burned. 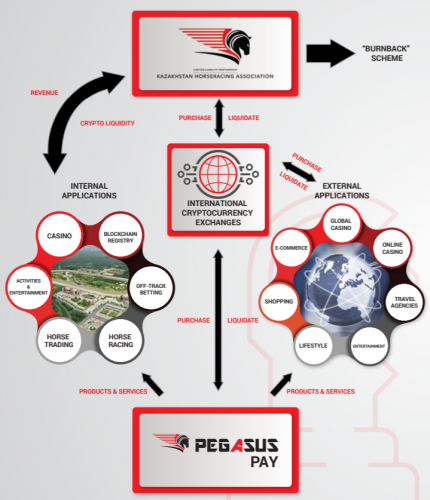 The Pegasus Ecosystem facilitates coin flow, aiming to increase demand through a wide range of applications, and decrease limited supply through the Burnback scheme. Together, this is expected to gradually bolster the overall value of Pegasus Coins.